"We were all so tired that we forgot the fear." Rapturous film reviews almost always set up unfairly high standards if you haven't yet seen the movie, and since I fell victim on this one, I'll try and keep you from doing the same. When the film was released theatrically in 1982, David Denby, then writing for New York, went absolutely gaga for the picture, calling it something like the finest film he'd been called on to write about in his years as a critic; though it's really a lovely movie, you're unlikely to go quite as loopy. All of us (especially those who spend a significant amount of time writing about movies) want to share the good news, but we risk become Chicken Littles if every DVD fresh out of the box is this week's masterpiece of the century. So with that as prologue, the brothers Taviani have made a delicate and heartfelt memory piece, one that pays its respects to its Italian cinematic heritage while obviously laying a foundation for later audience favorites like Cinema Paradiso. 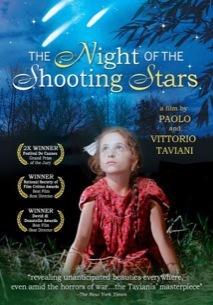 The film opens as a bedtime story, but quickly descends into nightmare�a mother tells her child about her adventures during World War II, and how the citizens of her Tuscan village fended off complete eradication at the hands of the Americans, the Germans, and one another. The nighttime tale is simply the framing story to set up the piece, as the movie is principally about the corrosive effects of war on small-town life. The villagers are faced with a horrifying choice: is it better to stay and watch your town be destroyed, or to run away with nothing and from everything you know? They bravely take on these awful challenges, and the spirit and poignancy of the movie comes from their understated, unbreakable spirit. Life goes on even in the face of such horrors�shotgun weddings and true romances, adolescent sexual explorations, petty rivalries and crushes and jealousies, family feuds that go back generations. The Nazis could destroy a lot, but not the long-nursed grudges of the most stubborn Tuscans. Though it's shot in color, the movie is close to the spirit of the early Neorealists, with their focus on and appreciation of those who don't inhabit the highest strata of the bourgeoisie�you sense that the Tavianis know well and deeply love movies like Bicycle Thieves and La Terra trema, and that most venerable of Italian institutions, the Catholic Church, is portrayed almost exclusively as a house of reason in a world of madness. But the filmmakers want to do more than simply reinvigorate the documentary-like style of Visconti and De Sica�the film is shot through with the kind of whimsy that you might not expect from a war movie, and even approaches a sort of magic realism. The deep sense of nostalgia makes the last portion of the movie that much more upsetting, when the savagery of war is made abundantly clear�devotion to Mussolini, for instance, is enough for neighbor to kill neighbor, and the arrival of the Americans is taken in stride. (Most of the villagers are happy to see them, but about the best they have to offer are inflated condoms as balloons for the children.) You can see a sense of savagery and anarchy instilled in the children, but this also gets at what's more of a problem for the movie: it paints on such a broad canvas with so many characters and plotlines that it's easy to lose the narrative thread, and challenging to keep up with the many storylines. So you take away more of a general mood than of a particular journey, and it's got that amorphous Spirit of the People thing that can get a little saccharine, the sort of thing you see some of in The Grapes of Wrath. But there's certainly plenty here that's lovely and understated and heartfelt, so I'll see about cutting Denby some slack. Image Transfer Review: The print seems to have bled out significantly since the film was made, so the colors can look unduly dreary and dull for much of the run of the picture. The transfer of this compromised source material is adequate at best. Audio Transfer Review: The Italian 2.0 track has a fair amount of static and ambient noise; as with the image transfer, this feels competent though not careful. Extras Review: The DVD comes with a booklet featuring a brief essay on the film by Peter Bondanella, but the far more notable extra here is an interview (1h:23m:53s) with Paolo and Vittorio Taviani conducted by Carlo Lizzani, in which the brothers discuss their childhood, the evolution and nature of their collaboration, their body of work, and the particular memories that were so crucial to the look and feel of this film. The most interesting thing about it, though, is watching the two of them interact, finishing one another's sentences, alternately stepping on one another's pronouncements and ceding the field, giving us a sense of the interplay between them, on the set and off. A memory piece that borrows some of the finest stylistic elements from Neorealism and magic realism, with a feature-length directors' interview that makes it almost a double feature.